Work to repair a lifting bridge in Dorset will not be complete until the end of October - nearly five months later than originally planned. Poole Bridge closed in September 2016, with work initially predicted to take nine months, but the discovery of live cables and buried structures pushed the opening date back to September. 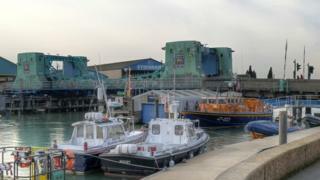 Borough of Poole said it was now clear the scheme would be further delayed. It said contractors would work weekends and extra hours to minimise disruption. The authority said the Hamworthy side of the £4.2m upgrade had proved more complex than expected after extensive remains of previous bridges - including timber piles - were unearthed. A major section of a buried quay wall has also been uncovered, along with live and abandoned utility cables. Rob Dunford, interim director of Dorset Local Enterprise Partnership, said: "We appreciate that this completion date is much later than expected but it is vital to the overall success of our Port of Poole programme that this construction work is carried out properly. "Poole Bridge offers a vital route into the port and these works are aimed at ensuring it continues to do so for many years yet. " Throughout the work, the 90-year-old bridge has remained in the open position for maritime traffic. Vehicles and pedestrians will continue to use the nearby Twin Sails Bridge, which opened in 2012.